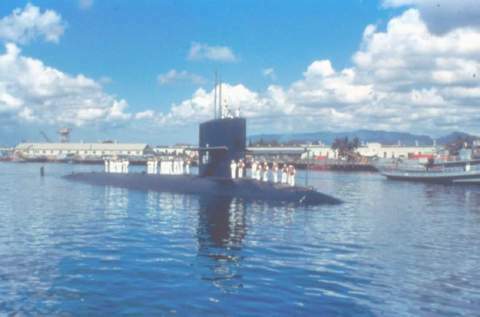 The second Queenfish (SSN-651) was laid down by the Newport News Shipbuilding and Dry Dock Co., 11 May 1964; launched 25 February 1966; sponsored by Hon. Julia Butler Hansen, Congresswoman from the State of Washington; and commissioned 6 December 1966, Comdr. Jackson B. Richard in command. Assigned a homeport and homeyard of Pearl Harbor, Queenfish reported to the Atlantic Fleet for onward routing to the Pacific Fleet. She serves with the Pacific Fleet into 1970 as a nuclear-powered attack submarine guarding this nation against the undersea forces of potential enemies.